I’m sure many of you will have seen already, but in yesterday’s local election we were successful in winning one of the three council seats in Calverley and Farsley. This is an amazing result, and the first election win for Labour in this ward for almost 25 years. And it was an excellent result across the board, with all three candidates receiving a higher vote than we normally would at a local election. 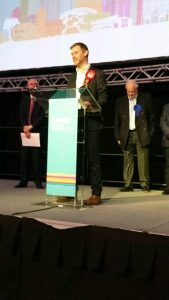 I am extremely proud to have been elected to represent the area in which I live, and that I love, and there is already much I would like to get started to improve the lives of people across Calverley, Farsley, Pudsey, Rodley, Stanningley, Thornbury and Woodhall and you will see more details over the coming days. By winning the third seat in the election, we have earned a year to show the people of Calverley and Farsley the difference a Labour and Co-operative councillor can have to their lives and there is already much I would like to get started. I would like to thank all of the residents who gave us their support, and the supporters who gave up their time to help in the campaign. The closeness of the result – just 47 votes in the end – shows just how much every vote, and every minute you all spent helping mattered, and culminates many years of hard work by our branch. With all of your help we will continue to make a positive difference to our communities for this year, and many more to come. Posted on 5th May 2018 by Peter Carlill / Posted in Calverley, Campaigns, Elections, Farsley, Pudsey, Rodley, Stanningley, Thornbury, Woodhall. To contact local councillor Peter Carlill about any local issues, use the details below. To get in touch with the local branch, for information on how to join, or to get involved in campaigning with the Labour Party, contact us on the details below. To get in touch about any local issues, or to get involved in campaigning with the Labour Party, contact us on the details below. Promoted by Karen Coldicott on behalf of Peter Carlill, both at 13 Farfield Avenue, Farsley LS28 5HD.